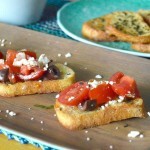 This recipe for Feta Kalamata Bruschetta (aka Greek Style) can be made no time at all and is packed with flavor. 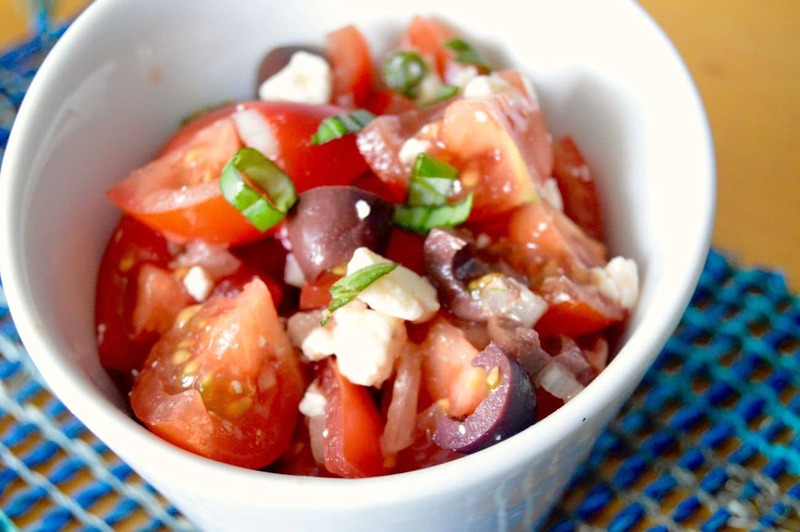 Creamy Feta, sweet, juicy tomatoes with just the right amount of salty kalamata olives! Put on top of your favorite toast or serve it alone as a simple salad! 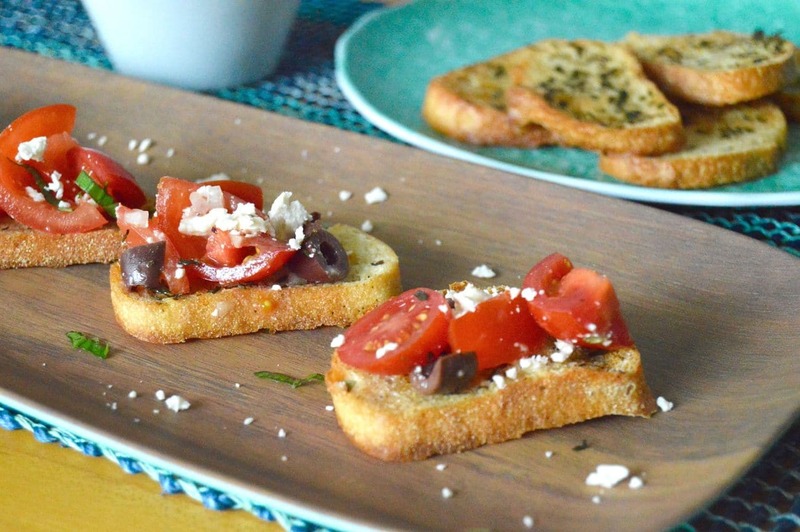 This recipe for Feta Kalamata Bruschetta is for all of you (and me) whose days are packed full from sun up to sundown but at the end of the day want to eat good food, made simply! This recipe for Feta Kalamata Bruschetta takes two skills: Cutting up the ingredients and stirring them. I kid you not, that’s all that you need to make this flavorful topping to go on toast, a cracker or even a slice of cucumber! 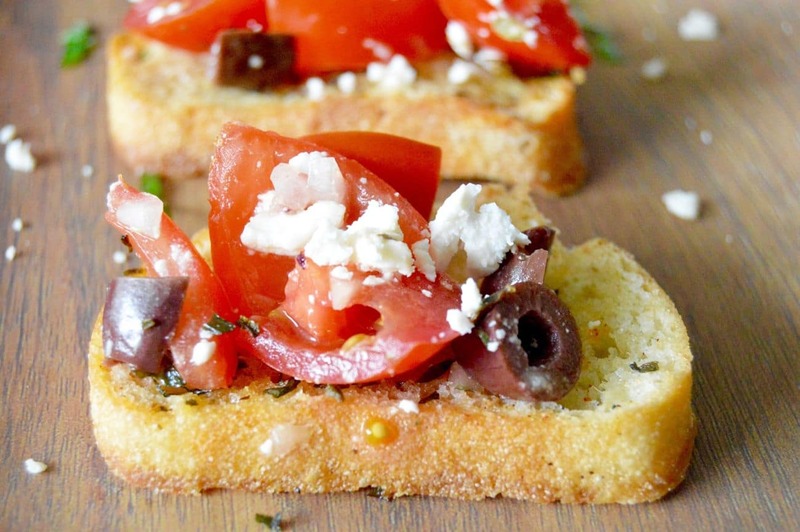 What’s the good stuff about Feta Kalamata Bruschetta? Easy/Hard: Easy, the hardest part it to not nibble too much when making it! Make Ahead/Made to Order: You can make this in the morning, and then serve it later. Actually I like to do it that way (even thought you can certainly make it right before.) When you give it time to meld together I think it is even better. Options: I use this as an appetizer but it also works well as a salad or stirred up with pasta! WIN/WIN! BONUS: It’s very healthy even if you do serve it on a toast. Serve it on a slice of cucumber and it’s extremely low carb! Alcohol Pairing: Any light red wine such as Chianti or even a bolder wine such as Pinot Noir because that would go well with the strong flavors of the olives and cheese. Stir all ingredients together in a bowl except for the salt and pepper. Allow to sit for 10 minutes up to 8 hours for the flavors to meld together. Right before serving season the tomato mixture with salt and pepper to taste. Spoon on to herb toasts or sliced cucumber pieces and serve immediately! Very versatile, use as a base for your favorite appetizer or as large crouton for a soup or salad! Slice baguette into 1/4" slices. Be sure to cut all slices the same width so they bake evenly. Place sliced baguette onto baking sheet. Stir together all ingredients except for salt and pepper. With a brush, brush butter/oil/herb mixture on to one side of bread slices. Lastly, sprinkle all toasts with seasoned salt and pepper. Bake for 15-20 minutes until golden brown and crunchy. Can be made ahead and stored for several days in an airtight container. You can rewarm in the oven if desired for 5 minutes! We made chicken bruschetta today found on an IG post, loved it! The kids helped make it and it was so simple and good. I love anything with olives and cheese. I have half a block of feta in my fridge from a watermelon/feta salad i made the other day. now i know where the leftover cheese is going! Yum and amaozng and definitely mystyle I made something like this last week and I’m already wanting it again. This looks yummy and ver healthy! I appreciate great food like this! If you have fresh ingredients, simple recipes are the best. This is one of my favorite combinations. Kalamata are the best olives ever and tomatoes will be in season soon. Yum! I love feta with anything. And I love your idea of putting it on cucumbers too. Super smart. Yum, I love Greek flavors and fresh tomatoes. This sounds like a refreshing healthy snack and I agree letting the flavors sit and mix will make it even tastier! Can’t say I’m a fan of olives but these pictures make me want to try this recipe. I think I would love to serve these during the holidays as well. I love bruschetta’s and I love feta cheese too. So you know this is going to be on the table at our house tonight. Thanks for sharing. I am from an Italian family and we eat bruschetta all of the time. I have never thought to make a Greek version! These look and sound delicious. I will be making these for lunch this week! I love anything with feta cheese on ti. Greek food is a favorite of mine, I can’t wait to try this! The herb toast sounds amazing. I love anything with feta. It has such a sour, yet rich flavor profile. I love recipes that look so beautiful but are also really easy to prepare! Great idea to add the alcohol pairing information! What a wonderful recipe. This would be great for any party. Going to try it out for some up coming events! It will work fine without the olives, you just may need to add a little extra salt to account for the missing olives! Enjoy! Serving this on cucumber slices will pretty much make it a hand sized greek salad!! One of my favorites! Congratulations on the opportunities headed your way! I love this recipe and I am so glad you mentioned pasta. I want to try this with pasta so badly! Thanks for sharing. You had me at Feta! I love the colors! Feta seems to be popping up in many of my recipes these days…. I agree! Yum! This sounds and looks divine! Congrats on all of your new opportunities! YUMMM love anything with kalamata olives! Glad to hear you’ve got exciting opportunities coming up!